On Tuesday morning, Kim Kardashian and Amber Rose left many confused after they both posted a selfie together. 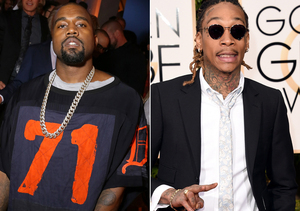 The selfie came just days after the reported feud between Wiz Khalifa, Kim’s husband Kanye West, and Amber. After Kanye mentioned her son, Sebastian, during a spat with Wiz, Amber called out Kanye with an explicit tweet on his sexual preferences. TMZ reports that Kardashian and Rose met up on Monday at Kris Jenner’s house, where they resolved their issues after a long conversation. See more Twitter responses to Kim and Amber’s selfie below!